What's a average price for a wedding dress? What's a average price for a wedding dress? I found a dress that I love and it costs 1250. Is that reasonable? Also how much are alterations usually? It really all depends what type of dress you have, and where you got it. Is it in your budget to spend &dollar;1250 on a dress? 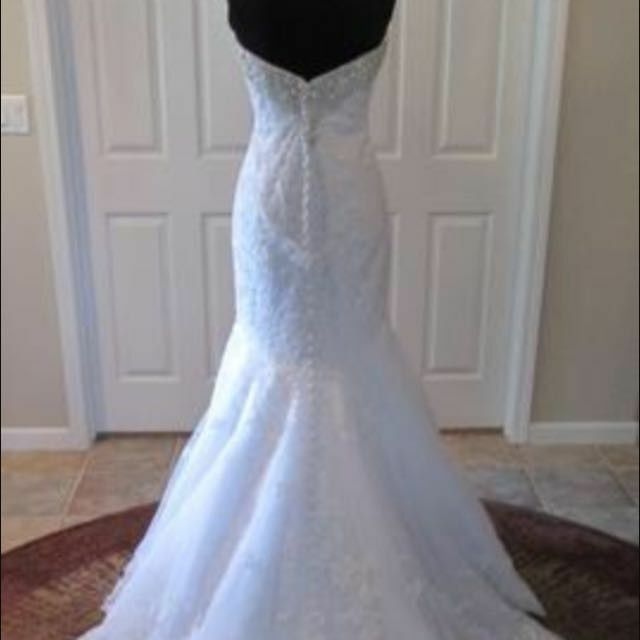 Picture of the dress and tell us what types of alterations. I spent &dollar;1150 for mine. This is a picture of it in all white. Im getting it in white and ivory. I feel like its worth it because of the beading. I originally said 1,000 as my budget for my wedding dress. Spend only what you feel comfortable spending on a wedding dress, it doesn't matter what anyone else here has spent. That being said, mine rings in right at 2000, so your's isn't expensive in my view. Try it on and see if it is worth going 250 over budget and if you can make cuts elsewhere in your budget to accommodate that 250. Factor in alterations as well which will probably cost hundreds of dollars easily. It's so pretty! And if you're comfortable with the price, I say splurge a little! Or maybe cut a few hundred dollars from another part of your budget? My dress was &dollar;1300. It's gorgeous! Since it's not quite in your budget, I'd recommend looking around at a few other dress shops to see if you can find a similar dress that has a slightly lower price tag. I can't guarantee you'll beat this one, but it really wouldn't hurt to try. When we went dress shopping, my mom asked each boutique what their average dress price was so we would know what we were walking into. 3 out of 4 shops had an average of &dollar;1500. The fourth shop was a little higher. My dress cost around &dollar;1800, but we ordered it with a hollow-to-hem and bust-waist-hip customizations to avoid major alterations later. The customizations totaled &dollar;267 (this amount is included in that &dollar;1800 total). I've read other brides on here with lace dresses have spent as much as &dollar;400 just on hemming a dress, and had I ordered a standard size, I would have needed major alterations in the bust on top of that. We would have been looking at much more than the &dollar;267 in alterations. Hems can cost different amounts based on how complicated the job is. If the material has an intricate pattern that needs ti be preserved, like the lace that I mentioned before, it can be super expensive because they have to remove the lace trim at the bottom of the dress, hem the remainder, and then see the place trim back on. Dresses without trims don't require quite as much work, so the cost wouldn't be as high. My dress was &dollar;1450 and veil was &dollar;354. To have my fitting done through the place I bought the dress alterations were &dollar;350 as well. I personally think that's around the average price. But it all depends what you're comfortable spending. Some people won't spend more than &dollar;100. Some people will spend &dollar;10,000. Just depends on budget. 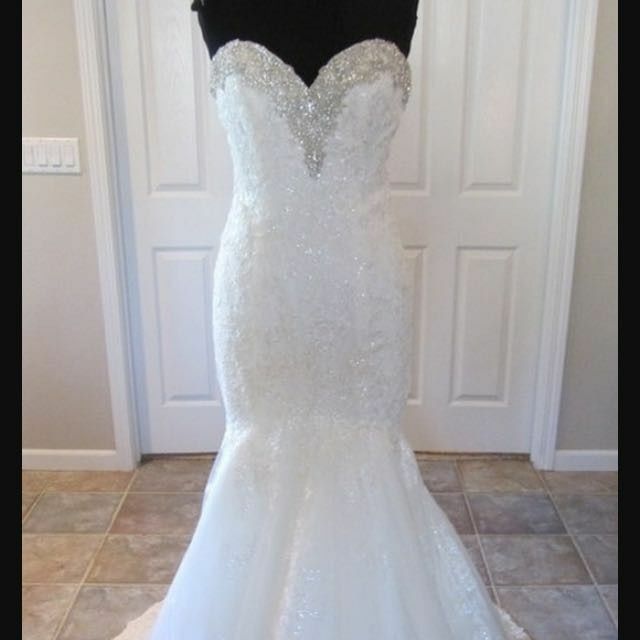 My dress was 1100, but only because my sweet FH snuck a thousand dollars into my bank account because he knew my budget was so low. Had he not done that, then my dress would have been unreasonably priced. It's all relative! That looks very similar to my dress (Allure 9266), which retails for &dollar;1400. Is this photo from a site like preownedweddingdresses.com or tradesy.com? Just asking because of the way the photos were taken. Also, I ended up spending &dollar;495 for dress alterations, which included having cups sewn in, side seams, hem, and bustle. Mine is &dollar;1100... I didn't want to spend that much, but I fell in love and so did my mom... the most expensive dress in the store was &dollar;2500.. it was a smaller boutique .. It depends on where you are, what your looking for, and what you can spend. I originally spent &dollar;1300 for a dress, but by the time my wedding rolled around I'd gained weight and they couldn't let it out enough. So I bought another dress for &dollar;170. It was the same body style, and it was gorgeous! There's such a big range of prices and factors that it's hard to come up with an average. There are dresses for &dollar;200 and dresses for &dollar;20,000. It's reasonable ...if you can swing it -do it !